The product of a Creative Partnership project with children at West Kidlington Primary School, Kidlington, Oxon. 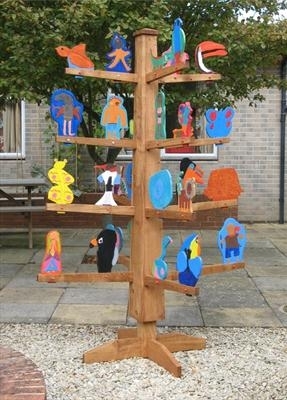 I built the "Tree" to carry the plywood shapes which were designed, carved, and painted [mostly] by the children. The aim of the project was to stimulate the children's speaking and writing abilities. The shapes can be changed around to tell a different story.